No, I think it was just a case of VTach. I am a resident studying for my boards in Australia. Thank you for the great cases. Loved the case of haemodynamic instability in severe hypokalaemia! The first case was also great, however I must confess that I am still not clear as to why the triangles are not identifying the “r” wave, not the t-wave as suggested in the case. I was wondering if you could clarify this matter for me? This case perhaps highlights a fundamental query I have regarding the anatomy ( and nomenclature) of the QRS complexes specifically in VT. 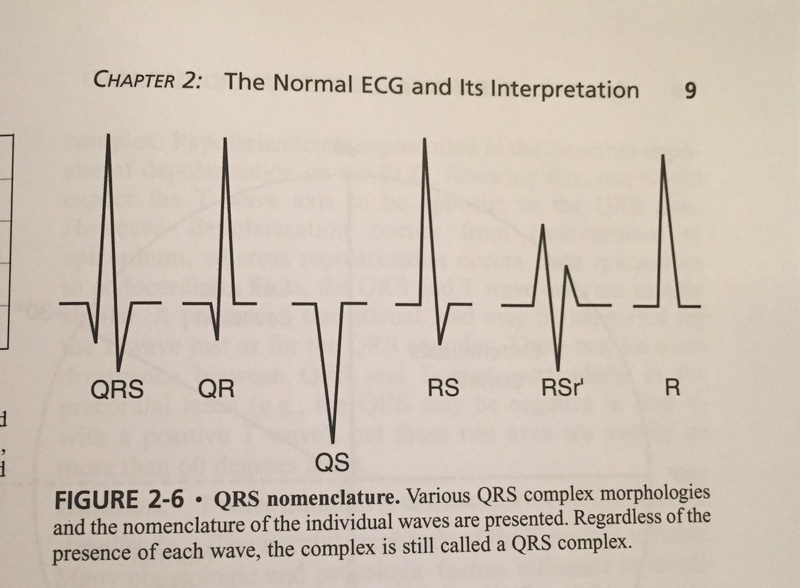 I understand that not all QRS complexes have all three components q,r,s present – this is nicely illustrated in your book “ECG in emergency medicine and acute care” – page 9 – (see attached photo). Following from this, to my understanding often the QRS complexes we see in VT don’t have all three components visible (i.e. q r and s), and often don’t haven an identifiable T wave as the QRS complex is wide. Please correct me if I’ve got it wrong. I’ve been searching the internet to find a series of different examples of VT where the individual components of the QRS and the T wave are marked clearly as you have done in this case. If the first negative deflection is referred to as a q wave, then wouldn’t it follow that the triangle is on the first positive deflection after the q wave , i.e. The r wave. I guess what I am asking is why do we believe that the triangle is on the “t” wave and not the R wave. And if this suggestion is true, does that then make the second positive deflection after the triangle the actual T wave , followed by the q wave of the next QRS . If I’ve got this completely wrong, please excuse my ignorance. To second your point, I think on the rhythm strip the QRS complex would be more accurately described as a QS wave since it’s a single downward deflection. The positive deflection afterwards is the T wave. One general rule of thumb I use to orient myself in V-tach is that the “pointiest” part must be part of the QRS complex. excellent point (so to speak)! During my paramedic student clinical in my local ED, I got to press the button for a pt thought to be in symptomatic SVT. Turned out between all the screaming he was in DKA (CBG ~450) and had necrotising pancreatitis. HR 135-140. Pt was begging for water and seemed to be agonized in pain.